Rogers Poultry is proud to offer MARY’S CERTIFIED ORGANIC FREE RANGE TURKEY as part of our SUSTAINABLE POULTRY PROGRAM. 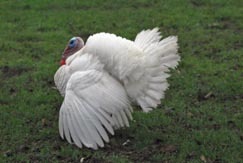 Mary’s Certified Organic Free Range Non GMO turkeys are an additional step up the ladder in humane farming practices. These Turkeys have freedom to move about and receive a premium diet void of any chemical stimulators. Certified organic feeds must be certified by the USDA, and everything that goes into them must be certified as well.